In 1824 it was suggested that Schubert should write a work similar to Beethoven’s Septet (also recorded by the Gaudiers for Hyperion). He subsequently approached the project with such enthusiasm and concentration that a friend wrote of him, ‘If you go and see him during the day he says “Hello. How are you?” and carries on working, whereupon you leave’. Schubert added a second violin to Beethoven’s scoring for clarinet, bassoon, horn, violin, viola, cello and double bass, but adhered to the Septet’s movement structure and key sequences almost entirely. However, the melody and beauty that infuse the Octet are quintessentially Schubert, and justify the work’s enduring popularity. Here are outstanding performances from an ensemble that draws together some of the most distinguished musicians in Europe. Like comparable works by Spohr, Hummel and others, Schubert’s irresistible Octet is a late offshoot of the eighteenth-century tradition of serenades scored for mixed wind and strings. And together with the B flat Piano Trio, D898, it comes closer than any of his other late instru­mental works to the popular image of the companionable, echt-Viennese composer pouring out a stream of spontaneously inspired melody. We owe its existence to Count Ferdinand Troyer, a talented amateur clarinettist who was chief steward at the court of Beethoven’s friend and pupil, Archduke Rudolf. Early in 1824 the count proposed that Schubert write a follow-up to Beethoven’s Septet, which to its composer’s intense irritation had become a runaway success. (When Beethoven learnt of its triumph in England he was heard muttering that the work should be burned.) Schubert duly obliged, adding a second violin to the Septet’s line-up of clarinet, bassoon, horn, violin, viola, cello and double bass, and broadly following Beethoven’s six-movement plan: he likewise prefaced the outer movements with a slow introduction, included both a scherzo and a minuet, and between them inserted a set of variations on a popular-sounding theme. After visiting the composer some time during February 1824, the painter Moritz von Schwind wrote to their mutual friend Franz von Schober: ‘Schubert has now long been at work on an octet, with the greatest enthusiasm. If you go and see him during the day he says “Hello. How are you?” and carries on working, whereupon you leave.’ Schubert completed the score on 1 March, and the first performance took place at the home of a Viennese nobleman, Anton, Freiherr von Spielmann, later that month. Besides Troyer himself, the players included the renowned violinist Ignaz Schuppanzigh and several others who had given the premiere of Beethoven’s Septet nearly a quarter of a century earlier. Although there was another private performance of the Octet at the home of Franz Lachner in 1826, its first public airing, with most of the original players, was not until April 1827, in the hall of the Vienna Gesellschaft der Musikfreunde. Some contemporary reports found it too long, though the Wiener Allgemeine Theaterzeitung called it ‘friendly, agreeable and interesting’, and ‘worthy of the composer’s well-known talents’—a revealing counter to the old myth that Schubert worked in virtual obscurity, appreciated only by a circle of close friends. With its melodic and rhythmic elan and its kaleidosco­pically varied colours, the Octet, like Mozart’s great wind serenades, raises the hedonistic spirit of the late eighteenth-century divertimento to a supreme level. Its scoring is endless­ly inventive: at times, especially in the outer movements and scherzo, Schubert uses the ensemble like a small orchestra, with the two violins in octaves and sharp contrasts between solo and tutti sonorities; at others, especially in the Adagio and minuet, string and wind colours are blended with the finesse of true chamber music. 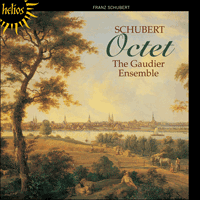 If the Octet, in keeping with its diver­timento origins, is fundamentally genial and relaxed, the work is shot through with that sense of yearning, of the evanescence of beauty, that haunts Schubert’s later music; and once or twice—in the brooding coda of the Adagio, or the slow introduction of the finale—we glimpse the dark, depressive world of the String Quartets in A minor and D minor that Schubert composed virtually simultaneously with the Octet. The imposing, tonally wide-ranging introduction imme­diately announces a dotted motif which is to permeate the following Allegro and influence many of the ideas in later movements. Just before the Allegro clarinet and then horn sound a rising octave figure, again in dotted rhythm, which likewise has echoes later in the work. For all its breezy exuberance, the Allegro itself is tightly argued and unified—reminding us of a much-quoted letter to the painter Leopold Kupelwieser in which Schubert declared that he had composed the Octet and the two quartets of 1824 in preparation for ‘a grand symphony’. The ubiquitous opening phrase of the first theme underpins the second subject, sounded on the clarinet in a plangent D minor and then repeated by the horn in F major. With typical unorthodoxy, Schubert long delays settling in the expected dominant key, C major, which only arrives, with a flurry of violin semiquavers, after protracted ruminations on the main theme. The tautly worked development—so much for Schubert’s supposed prolixity—glides immediately into the strange and remote key of F sharp minor: here the second subject acquires a yearning continuation on the clarinet, and is then transformed more radically, first by the clarinet, then by second violin and viola in imitation, against the pervasive leaping dotted figure on the first violin. After a breathtaking sideslip to A flat major the wind trio intones a chorale-like theme rhythmically akin to the slow introduction; the connec­tion is underlined when Schubert brings back the introduction’s opening phrases just before the recapitulation, reinforcing the close integration of introduction and Allegro. A speeded-up version of the main theme launches the coda, promising a rousing send-off. But then, in a moment of pure romantic poetry, the pulse relaxes for a final, nostalgic reminiscence of the second subject, sounded on the horn as if from the depths of the forest. The Adagio, somewhere between a barcarolle and a lullaby, is one of Schubert’s loveliest, opening with a dream of a melody for his clarinettist patron and constantly enriched by the composer’s genius for devising ravishing countermelodies. Though the movement is cast in abridged sonata form (without a central development), the abiding impression is of a timeless flow of glorious, almost improvisatory lyricism. After the reprise of the main theme, first on the violin in counterpoint with the horn, then on cello and clarinet, Schubert offsets the lack of a formal development section in dramatic series of modulations. The coda begins serenely enough, with the violins playing in canon; but then a sudden violent off-beat accent for pizzicato cello and bass heralds a weird, disquieting passage where, in a slow crescendo, the clarinet broods obsessively on the movement’s opening phrase over anxiously palpitating strings. This momentary glimpse of the abyss is summarily banished in the bracing scherzo, a delightfully bucolic movement with overtones of the hunt (and more dotted rhythms)—though amid the alfresco jollity Schubert is always likely to surprise us with sudden shifts to distant keys. High spirits are more subdued in the trio, with its smooth, shapely melody, initially for string quartet alone, over a stalking cello line. For his variation movement Schubert pilfered a cheerful, homely duet from his unperformed comic opera of 1815, Die Freunde von Salamanka (‘The Friends from Salamanca’). Following classical precedent, the first four variations, all rooted to the home key of C major, are essentially decorative, with first violin, horn and cello in turn taking the limelight. But the fifth in C minor—eerie, scurrying night music that pre-echoes the ‘Ride to Hell’ in Berlioz’s Damnation of Faust—and the sixth in A flat, which dissolves the theme in tender, luminous polyphony, are romantic character pieces. Sentiment is wickedly undercut in the final variation, where the winds do a comic take on a village band against a hyperactively cavorting violin. Like some of Beethoven’s minuets—most famously that of the eighth Symphony—Schubert’s fifth movement is a stylized, faintly nostalgic re-creation of the classical courtly dance. It is surely no coincidence that the initial dotted figure is identical to the pervasive motif of the opening movement. The first section closes with a naggingly memorable cadential phrase featuring both triplets and dotted rhythms; in the second part, after a poetic dip from C to A flat, this is delici­ously expanded by the clarinet before the music dissolves in a chromatic haze. The lolloping Ländler trio (whose opening phrase inverts the minuet’s dotted upbeat) again conjures up village band associations. After a repeat of the minuet the hushed, twilit coda introduces a romantically evocative horn solo that inevitably calls to mind the close of the first movement. With its ghostly tremolandos, steepling crescendos and labyrinthine tonality, the finale’s introduction creates a scene of high drama. Shades, perhaps, of the Wolf’s Glen in Weber’s Der Freischütz, a favourite opera of Schubert’s. But the doom-laden dotted figures in wind and upper strings also echo the bleak Schiller setting ‘Die Götter Griechenlands’ (‘The Gods of Greece’) which Schubert quoted in the contemporary A minor Quartet. Grand guignol or a personal confession? Whatever the composer’s intent, this introduction is startling in the context of such a generally cheerful work. After the music has sub­sided to a ppp shudder, the tonality clears to a cloudless F major for the brisk, bristling march theme of the Allegro. A smoother subsidiary idea, still in F major, leads to a chirpy second subject (linked to the main theme by its persistent trilling motif) that could have fast-talked its way straight out of a Rossini opera. But the comedy quickly takes a serious turn as Schubert puts the trilling figure through its paces in strenuous imitation. Another plunge from C to A flat signals the development, where the march theme is subjected to tense contrapuntal treatment through an audacious series of modu­lations. Then, after a lull and an exciting protracted crescendo, the recapitulation enters, à la Beethoven, in a triumphant fortissimo. Schubert reserves his biggest dramatic coup for the closing pages, where the music of the slow introduction crashes in without warning, now made even more ominous by eerie flourishes from the first violin. But the oppressive atmosphere is quickly dispelled by the coda, which speeds up the march theme and transforms it into an increasingly riotous rustic dance. À l’instar d’œuvres comparables par Spohr, Hummel et d’autres, l’irrésistible Octuor de Schubert s’inscrit, malgré sa date de composition (1824) dans la tradition des sérénades pour cordes et vents du XVIIIe siècle. Avec le Trio pour piano, violon et violoncelle en si bémol majeur D898, l’Octuor se rapproche bien plus de l’image populaire du compositeur sociable et très viennois, débordant de mélodies à l’inspiration spontanée. Nous devons son existence au Comte Ferdinand Troyer, clarinettiste amateur de talent et intendant en chef à la cour de l’ami et élève de Beethoven, l’Archiduc Rudolf. Au début de l’année 1824, le Comte proposa que Schubert écrivît la suite du Septuor de Beethoven, qui au grand dam de son auteur était devenu un immense succès. (Lorsque Beethoven eut connaissance de son triomphe en Angleterre, on l’entendit marmonner que l’œuvre devrait être brûlée.) Schubert s’exécuta avec obligeance et, ajoutant un second violon aux sept instruments, clarinette, basson, cor, violon, alto, violoncelle et contrebasse, suivit les grandes lignes du plan en six mouvements conçu par Beethoven: il donna en préface aux autres mouvements une introduction lente, inclut un scherzo et un menuet, et intercala entre eux un ensemble de variations sur un thème d’une mélodie populaire. Après sa visite chez le compositeur en février 1824, le peintre Moritz von Schwind écrivit à leur ami commun, Franz von Schober: «Schubert travaille maintenant depuis long­temps sur un octuor, avec le plus grand enthousiasme. Si vous le voyez pendant la journée, il vous dit ‘Bonjour, comment allez-vous?’ et il continue de travailler, après quoi vous partez.» Schubert termina la partition le 1er mars et la première audi­tion eut lieu plus tard le même mois, à la demeure d’un noble viennois, Anton, Freiherr von Spielmann. En plus de Troyer lui-même, les interprètes comptèrent le violoniste renommé Ignaz Schuppanzigh et de nombreux autres musiciens ayant donné la première audition du Septuor de Beethoven presque un quart de siècle plus tôt. Bien que l’Octet fît l’objet d’un autre concert privé chez Franz Lachner en 1826, sa première représentation publique, avec la plupart des musiciens d’origine, n’eut pas lieu avant avril 1827, dans la grande salle de la Vienna Gesellschaft der Musikfreunde (Société viennoise des amis de la musique). Certains rapports de l’époque le trouvèrent trop long, mais le Wiener Allgemeine Theaterzeitung le qualifia d’«agréable, plaisant et intéressant» («freundlich, gefällig und interessant») et de «digne du talent bien connu du compositeur» («im Einklang mit dem wohlbekannten Talent des Komponisten»), ce qui contredit la vieille légende selon laquelle Schubert travaillait quasiment dans l’ombre et n’était apprécié que par un cercle d’amis proches. L’élan mélodique et rythmique et les couleurs de timbre aux mille nuances de cet Octuor, à l’instar des grandes sérénades pour vents de Mozart, portent l’esprit hédoniste du divertimento de la fin du dix-huitième siècle au pinacle. L’écriture est inventive à l’infini: parfois, et particulièrement dans les mouvements extérieurs et dans le scherzo, Schubert utilise l’ensemble comme un petit orchestre, avec les deux violons à l’octave et des contrastes frappants entre solo et tutti; ailleurs, surtout dans l’Adagio et le menuet, les tons des cordes et des vents se mêlent avec la finesse de la plus pure musique de chambre. Si cet Octuor, dans la tradition des diver­timenti, est fondamentalement plaisant et détendu, l’œuvre n’en est pas moins tirée d’un désir ardent et de l’évanescence de la beauté qui hante la musique plus tardive de Schubert; et une ou deux fois, dans la coda troublante de l’Adagio ou dans la lente introduction du final, nous percevons le reflet sombre et dépressif des quatuors en la mineur et ré mineur que Schubert composa presque en même temps que l’Octuor. L’introduction imposante et variée dans ses tonalités an­nonce immédiatement un motif en notes pointées qui pénètre l’Adagio qui suit et influence nombre des idées présentes dans les mouvements suivants. Juste avant l’Allegro, la clarinette puis le cor entonnent un trait montant à l’octave, toujours dans ce rythme à notes pointées, qui résonne comme un écho dans le reste de l’œuvre. Malgré sa joviale exubérance, l’Allegro lui-même est travaillé et unifié, nous rappelant par-là une lettre souvent citée au peintre Leopold Kupelwieser, dans laquelle Schubert déclare qu’il a composé l’Octuor et les deux quatuors de 1824 en préparation d’une «Grande Symphonie». La phrase d’ouverture omniprésente du premier thème souligne le second sujet, joué à la clarinette dans un retentissant ré mineur et repris au cor en fa majeur. Dans sa manière typiquement peu orthodoxe, Schubert retarde longuement l’assise de la tonalité dominante attendue d’ut majeur qui n’arrive, dans une risée de demi-croches au violon, qu’après force ruminations prolongées sur le thème principal. Le développement au travail très sobre (où est passée la légendaire prolixité de Schubert?) glisse immédiatement dans l’étrange et distante tonalité de fa dièse mineur: c’est là que le second sujet se poursuit avec nostalgie à la clarinette puis est radicalement transformé, toujours à la clarinette et ensuite au second violon et à l’alto par imitation, sur fond de motif pénétrant en notes pointées au premier violon. Après une glissade époustouflante vers le ton de la bémol majeur, le trio de vents entonne un thème en choral, similaire dans sa rythmique à la lente introduction; le lien est évident lorsque Schubert reprend les phrases d’ouverture de l’introduction juste avant la récapitulation, renforçant ainsi l’intégration étroite de l’introduction et de l’Allegro. Une version accélérée du thème principal introduit la coda et promet un envoi vibrant. C’est alors que dans un moment de pure poésie romantique, le tempo se détend pour entrer dans une rémi­niscence finale nostalgique du second sujet, repris au cor comme du fin fond d’une forêt profonde. L’Adagio, à mi-chemin entre la barcarolle et la berceuse, est l’un des plus beaux de Schubert. Il s’ouvre sur une mélodie de rêve pour le clarinettiste et ne cesse de s’enrichir des contre-chants enchanteurs conçus par le génie du compositeur. Bien que le mouvement s’inscrive dans une forme de sonate abrégée (sans développement central), l’impression constante qu’on en tire est celle d’un lyrisme sans âge, glorieux, presque improvisé. Après la reprise du thème principal, d’abord au violon en contrepoint avec le cor puis au violoncelle et à la clarinette, Schubert remplace l’absence de développement formel par une série spectaculaire de modulations. La coda commence dans la sérénité, avec les violons jouant en canon; soudain, un accent violent sur les temps faibles, joué pizzicato au violoncelle et à la contrebasse annonce un passage inquié­tant dans lequel, en un lent crescendo, la clarinette se lamente jusqu’à l’obsession sur le phrasé d’ouverture du mouvement, sur fond de palpitations anxieuses aux cordes. Cet aperçu furtif de l’abîme est sommairement éclipsé par le scherzo énergique, mouvement merveilleusement bucolique aux harmoniques de chasse (et davantage de rythmes en notes pointées). Pourtant, dans cette gaieté alfresco, Schubert ne parvient pas moins à nous surprendre par des glissements soudains dans des tonalités distantes. La jovialité est estom­pée dans le trio à la mélodie douce et ronde, initialement pour le quatuor à cordes sur une ligne digne au violoncelle. Pour ce mouvement de variation, Schubert chaparde un duo simple et gai à son opéra comique non exécuté de 1815, Die Freunde von Salamanka («Les Amis de Salamanque»). Conformes à leurs précédents classiques, les quatre premières variations, toutes ancrées dans le ton d’ut majeur, sont essentiellement décoratives et mettent successivement l’accent sur le premier violon, le cor et le violoncelle. Mais la cinquième, en ut mineur, est une musique de nuit furtive et mystérieuse qui fait prélude au «Voyage en enfer» de La Damnation de Faust de Berlioz, et la sixième variation, en la bémol, dissout le thème en une polyphonie tendre et lumineuse. Toutes deux sont des pièces à caractère romantique. La dernière variation, quant à elle, coupe court à tout sentiment: les vents se lancent dans une imitation comique d’une fanfare villageoise et le violon dans des cabrioles exubérantes. Comme certains des menuets de Beethoven, surtout celui de la huitième symphonie, le cinquième mouvement de Schubert est une reproduction stylisée et légèrement nostalgique d’une danse courtoise classique. Nous ne devons certainement pas à la coïncidence le trait initial en notes pointées, identique au motif entêtant du mouvement d’ouverture. La première partie se referme sur une mémorable phrase en cadence qui présente à la fois des triolets et des rythmes pointés; dans la deuxième partie, après une descente poétique d’ut à la bémol, l’atmos­phère se développe gracieusement à la clarinette avant de s’évaporer dans une brume chromatique. Le galop du trio Ländler (dont la phrase d’ouverture vient contredire les accents du menuet en notes pointées) rappelle encore la fanfare villa­geoise. Après une répétition du menuet, la coda susurrée introduit un solo évocateur de romantisme au cor qui n’est pas sans faire écho à la fin du premier mouvement. Avec ses tremolandos mystérieux, ses crescendos abrupts et ses tonalités sinueuses, l’introduction du final crée un paysage dramatique. On y retrouve, peut-être, l’ombre de la Gorge du loup de l’un des opéras préférés de Schubert, Der Freischütz. Mais les sombres et tristes notes pointées aux vents et aux cordes supérieures font aussi écho à la scène lugubre de «Die Götter Griechenlands» de Schiller, auxquels Schubert fait allusion dans le quatuor contemporain en la mineur. Grand guignol ou confession personnelle? Quelle que soit l’intention du compositeur, cette introduction est étonnante dans le contexte d’une œuvre généralement aussi gaie. Après le murmure ppp de la musique, la tonalité s’éclaircit en un fa majeur sans nuage pour aborder le thème de marche vive et énergique de l’Allegro. Une idée plus douce, toujours en fa majeur, vient s’immiscer pour amener un second sujet tout en bonne humeur (lié au thème principal par son motif persistant en trilles) qui semble tout droit sorti d’un opéra de Rossini. Mais la comédie prend vite des airs sérieux alors que Schubert utilise les trilles, par leur propre tempo, pour une imitation ardue. Un autre plongeon d’ut en la bémol donne le signal du développement où la marche est soumise à un contrepoint tendu par une série de modulations audaci­euses. Et puis après une accalmie suivie d’un long crescendo, arrive la récapitulation à la Beethoven, dans un fortissimo triomphal. Schubert réserve son coup le plus dramatique aux dernières pages, alors que la musique de la lente introduction fait brusquement irruption, son sinistre présage interprété au premier violon par des traits inquiétants. Enfin, cette atmosphère oppressante est rapidement dissipée par la coda qui accélère le thème de la marche pour le transformer en une danse champêtre de plus en plus exubérante. Wie die vergleichbaren Werke von Spohr, Hummel und anderen ist Schuberts unwiderstehliches Oktett ein Nachzügler in der aus dem 18. Jahrhundert stammenden Tradition von Serenaden für Bläser und Streicher. Zusammen mit dem Klaviertrio in B-Dur, D 898 kommt das Oktett mehr als irgend ein anderes Instrumentalwerk aus der späten Schaffensperiode dem bekannten Image des geselligen, echt wienerischen Komponisten am nächsten, der nur so vor spontan inspirierten Melodien überschäumt. Wir verdanken die Existenz des Oktetts dem Grafen Ferdinand Troyer, ein talentierter Amateurklarinettist, der seineszeichens Ober­hof­meister am Hofe von Beethovens Freund und Schüler Erzherzog Rudolf war. Der Graf schlug zu Beginn des Jahres 1824 Schubert vor, er solle eine Fortsetzung zu Beethovens Septett schreiben, über dessen einschlagenden Erfolg Beethoven zu seiner Zeit äußerst verärgert gewesen war (als Beethoven über den englischen Siegeszug des Septetts erfuhr, hörte man ihn murmeln, dass das Werk verbrannt werden sollte). Schubert kam der Aufgabe pflichtbewusst nach, wobei er eine zweite Violine zur Septettaufstellung aus Klarinette, Fagott, Horn, Violine, Viola, Violoncello und Kontrabass hinzufügte und sich im Großen und Ganzen an Beethovens Satzfolge aus sechs Sätzen hielt: Auch Schubert stellt den Außensätzen eine langsame Einleitung voran, schreibt sowohl ein Scherzo und einen separaten Menuettsatz und fügt zwischen beide eine Variationsreihe über ein bekannt klingendes Thema. Nachdem der Maler Moritz von Schwind Schubert einmal im Februar 1824 besucht hatte, schrieb er an den gemein­samen Freund Franz von Schober: „Schubert hat nun lange mit größter Begeisterung an dem Oktett gearbeitet. Falls man sich aufmacht und ihn tagsüber besucht, sagt er: ‘Hallo. Wie geht’s?’ und arbeitet einfach weiter, worauf man sich zurückzieht.“ Schubert beendete die Partitur am 1. März, und die erste Aufführung fand im gleichen Monat im Hause des Wiener Aristokraten Anton, Freiherr von Spielmann statt. Zu den Musikern gehörten neben Troyer der bekannte Violinist Ignaz Schuppanzigh und ein paar andere, die fast ein Viertel­jahrhundert zuvor die Premiere von Beethovens Septett gegeben hatten. Obwohl es 1826 im Hause Franz Lachners noch eine weitere Privataufführung des Oktetts gab, war die erste öffentliche Aufführung mit den meisten der ursprünglichen Musiker nicht bis zum April 1827 im Saal der Gesellschaft der Musikfreunde. Einige zeitgenössische Rezensionen fanden das Oktett zu lang, obwohl es die Wiener Allgemeine Theater­zeitung „freundlich, gefällig und interessant“ nannte und „im Einklang mit dem wohlbekannten Talent des Komponisten“—ein aufschlussreicher Gegenbeweis für die verbreitete Meinung, Schubert habe angeblich mehr oder weniger in totaler Abgeschiedenheit gearbeitet und wäre nur von einem engen Freundeskreis geschätzt worden. Wie die großen Bläserserenaden Mozarts hebt das Oktett mit seinem melodischen und rhythmischen Elan und seinen kaleidoskopisch zusammengesetzten Klangfarben den hedonistischen Geist des Divertimentos aus dem späten 18. Jahrhundert auf ein äußerst hohes Niveau. Der Einfalls­reichtum bei der Instrumentierung des Oktetts ist unbegrenzt. Zuweilen, besonders in den Außensätzen und im Scherzo, nutzt Schubert das Ensemble wie ein kleines Orchester, zum Beispiel durch Oktavparallelen der zwei Violinen oder durch scharfes Kontrastieren zwischen Solo- und Tuttiklängen. Dann wiederum werden Streicher- und Bläserklänge mit der Finesse wahrer Kammermusik gemischt, besonders im Adagio und im Menuett. Selbst wenn im Oktett in Übereinstimmung mit seiner Herkunft aus dem Divertimento grundsätzlich eine freundliche und entspannte Stimmung herrscht, ist das Werk ebenso mit den aus anderen Spätwerken Schuberts bekannten Gefühlen der Sehnsucht und der Zerbrechlichkeit von Schönheit durchwoben. In der schwerblütigen Koda des Adagios oder in der langsamen Einleitung zum Finale werden uns ein- oder zweimal kurze Einblicke in die dunkle, depressive Welt der Streichquartette in a-Moll und d-Moll gewährt, die Schubert fast zeitgleich zum Oktett schrieb. In der imponierenden, harmonisch weit ausgreifenden Einleitung erscheint sofort ein Motiv mit punktiertem Rhythmus, welches das folgende Allegro bestimmen und viele Ideen in den späteren Sätzen beeinflussen wird. Kurz vor dem Allegro bläst die Klarinette und darauf folgend das Horn eine Oktavmotiv, wiederum im punktierten Rhythmus, das ebenso später im Werk wieder anklingen soll. Trotz des herrschenden fröhlichen Überschwangs ist das Allegro ökonomisch und einheitlich gebaut, was uns an einen viel zitierten Brief des Malers Leopold Kupelwieser erinnert, in dem Schubert erklärte, er habe das Oktett und die zwei Quartette von 1824 in Vorbereitung auf eine „große Symphonie“ geschrieben. Das allgegenwärtige Eröffnungsmotiv des Hauptthemas stützt das vorerst von der Klarinette in einem klagenden d-Moll vorgetragene und dann vom Horn in F-Dur wiederholte Seiten­thema. In typisch unkonventioneller Weise verzögert Schubert lange die Bestätigung der erwarteten Dominanttonart C-Dur, die erst durch ein aufgeregtes Treiben aus Sechzehntelnoten nach langwierigem Grübeln über das Hauptthema erreicht wird. Die streng gearbeitete Durchführung—mit Schuberts angeblicher Weitschweifigkeit ist wohl nichts—rutscht sofort in die ungewöhnliche und entfernte Tonart fis-Moll. Hier wird das Seitenthema in sehnsüchtiger Weise durch die Klarinette fortgeführt und dann auf dem Hintergrund des allgegenwärtig punktierten Motivs in den Sprüngen der ersten Violine erheblich umgeformt, zuerst wiederum durch die Klarinette und dann durch die sich gegenseitig imitierenden zweite Violine und Viola. Nach einem atemberaubenden Abstecher nach As-Dur stimmt das Bläsertrio ein Choral-ähnliches Thema an, das rhythmische Ähnlichkeiten zur langsamen Einleitung aufweist. Diese Assoziation wird bestätigt, wenn Schubert das Eröff­nungsmotiv der Einleitung kurz vor der Reprise wieder aufnimmt und damit die enge Verbindung zwischen Einleitung und Allegro bestätigt. Eine beschleunigte Version des Haupt­themas eröffnet die Koda mit dem Versprechen eines triumphalen Abschlusses. Aber dann entspannt sich der Pulse in einem Moment purer romantischer Lyrik für eine letzte nostalgische Erinnerung an das vom Horn angestimmte Seitenthema, als ob es aus den Tiefen des Waldes tönte. Das zwischen einer Barkarole und einem Wiegenlied angesiedelte Adagio gehört zu Schuberts schönsten langsamen Sätzen. Es beginnt mit einer Perle von einer Melodie für den auftraggebenden Klarinettisten und wird durch die Gabe des Komponisten für hinreißende Gegenmelodien ständig bereichert. Obwohl der Satz in eine gekürzte Sonatenform gegossen ist (ohne eine zentrale Durchführung), entsteht zwangsläufig der Eindruck eines zeitlosen Flusses von anscheinend improvisierter Lyrik. Nach der Reprise des Hautthemas, zuerst in der Violine im Kontrapunkt mit dem Horn, dann von dem Violoncello gespielt und gefolgt von der Klarinette, gleicht Schubert den Mangel eines formalen Durchführungsabschnitts mit einer Reihe dramatischer Modulationen aus. Die Koda scheint mit den im Kanon spielenden Violinen ziemlich gelassen zu beginnen, aber dann kündigt ein gewaltsamer Akzent auf schwacher Zählzeit durch die Bläser und ein Pizzicato im Violoncello und Kontrabass eine merkwürdige, beunruhigende Passage an, in der die Klarinette über ängstlich zitternden Streichern bei langsamen Crescendo besessen über das Eröff­nungs­motiv des Satzes nachgrübelt. Von diesem flüchtigen Blick auf den Abgrund wird man durch das forsche Scherzo abgelenkt, ein wunderbar bukolischer Satz mit Anklängen an eine Jagd (und noch mehr punktierte Rhythmen). Aber Schubert überrascht uns inmitten der ländlichen Fröhlichkeit wahrscheinlich immer mit plötzlichen Abschweifungen in entfernte Tonarten. Die gute Laune ist im Trio etwas gedämpft mit seiner glatten, wohlproportionierten, anfänglich vom Streichquartett allein gespielten Melodie über einer schleichenden Cellostimme. Für seinen Variationssatz behilft sich Schubert mit einem freundlichen, hausbackenen Duett aus seiner noch nicht aufgeführten komischen Oper von 1815 Die Freunde von Salamanka. Dem klassischen Beispiel folgend bestehen die erste vier, in der Tonika C-Dur verankerten Variationen hauptsächlich aus Verziehungen des Themas, wobei die erste Violine, das Horn und das Violoncello nacheinander ins Rampenlicht treten. Aber die fünfte Variation in c-Moll—eine unheimliche, huschende Nachtmusik mit Vorwegnahmen des „Ritts zur Hölle“ aus Berlioz’ La Damnation de Faust—und die sechste Variation in As, wo sich das Thema in zarte, leuchtende Polyphonie auflöst, sind romantische Charakterstudien. Allerdings wird die Stimmung in der abschließenden Variation schamlos unterhöhlt. Hier parodieren die Bläser eine Dorfkapelle, während die Violine unbändig herumtollt. Wie in einigen von Beethovens Menuetts, besonders in dem bekanntesten aus der 8. Sinfonie, ist Schuberts 5. Satz eine stilisierte, bisweilen nostalgische Nachschöpfung des klassischen Hoftanzes. Es ist sicherlich kein Zufall, dass es eine Identität zwischen dem diesen Satz eröffnenden punktierten Motiv und der allgegenwärtigen Geste des ersten Satzes gibt. Der erste Abschnitt schließt mit einer stark ein­prägsamen, abkadenzierenden Geste, die sich durch Triolen und wiederum durch punktierte Rhythmen auszeichnet. Nach einem poetischen Ausflug von C nach As wird im zweiten Teil diese Stimmung durch die Klarinette faszinierend erweitert, bevor sich die Musik im chromatischen Nebel auflöst. Das zuckelnde Ländler-Trio (dessen einleitende Takte den punktierten Auftakt des Menuetts umkehren) beschwört wieder Eindrücke einer Dorfkapelle. Nach einer Wiederholung des Menuetts führt die gedämpfte, zwielichtige Koda ein romantisch anmutendes Hornsolo ein, das unweigerlich das Ende des ersten Satzes in Erinnerung ruft. Mit ihren gespenstischen Tremolandos, krassen Crescendos und labyrinthischen harmonischen Fortschreitungen schafft die Einleitung zum Finale ein Szene von großem Drama: Anspielungen vielleicht an die Wolfsschlucht aus Schuberts Lieblingsoper Der Freischütz. Aber die in den Bläsern und hohen Streichern erscheinenden unglücksschweren punktierten Gesten spiegeln auch die trostlose Atmosphäre aus Schillers Gedicht „Die Götter Griechenlands“ wieder, das Schubert im zeitgleich entstandenen a-Moll-Quartett zitierte. Ein Grand Guignol-Drama aus Schock und Terror oder ein persönliches Bekenntnis? Was immer auch die Absicht des Komponisten gewesen sein mag, diese Einleitung ist im Kontext dieses weithin freundlichen Werkes verblüffend. Nachdem die Musik in einem Zittern in dreifachem Piano verebbt ist, klärt sich der Tonartenhimmel zu einem wolkenlosen F-Dur für das beherzte, draufgängerische Marschlied des Allegros. Eine eleganteres Nebenthema führt, immer noch in F-Dur, zu einem auf­ge­weckten Seitenthema (dass mit dem Hauptthema durch das anhaltende Trillermotiv verbunden ist), von dem man glauben könnte, es hätte sich geradewegs aus einer Rossini-Oper hier eingeschlichen. Aber aus dem Spaß wird bald Ernst, wenn Schubert das Trillermotiv in anstrengenden Imitationen durchexerziert. Eine weitere Abschweifung von C nach As deutet auf die Durchführung hin, in der das Marschlied einer strengen kontrapunktischen Verarbeitung durch eine Reihe waghalsiger Modulation unterzogen wird. Dann beginnt nach einer Atempause und einem erwartungssteigernd hinaus­gezögerten Crescendo wie bei Beethoven die Reprise mit einem triumphalen Fortissimo. Schubert wartet mit seinem besten dramaturgischen Coup bis zu den abschließenden Seiten. Dort bricht die Musik der langsamen Einleitung, die jetzt durch die geisterhaften Floskeln der ersten Violine noch beklemmender wirkt, ohne Warnung ein. Aber die drohende Atmosphäre ist schnell durch die Koda entspannt, die das Marschlied vorantreibt und es in einen zunehmend überschwänglichen, bäuerlichen Tanz verwandelt.